This magnificent stone sculpture is the product of master craftsmanship. Hand carved and polished in quality stone. 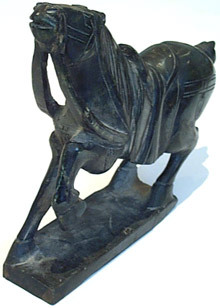 This stone carved horse is part of our stone carving collection. Click on the Show Related Product link below to see other hand carvings. Approximately 8" in length. This is a part of a set of three Dolphin/Child sculptures. Available in green, white, or pink. Approximately 3" tall.